SONIMAGE™ P3 | Konica Minolta Healthcare Americas, Inc.
No Need to Compromise. Ultrasound Designed for You. SONIMAGE™ P3 strengthens clinical confidence, aids in quick diagnosis, and enhances the patient and healthcare professional experience. 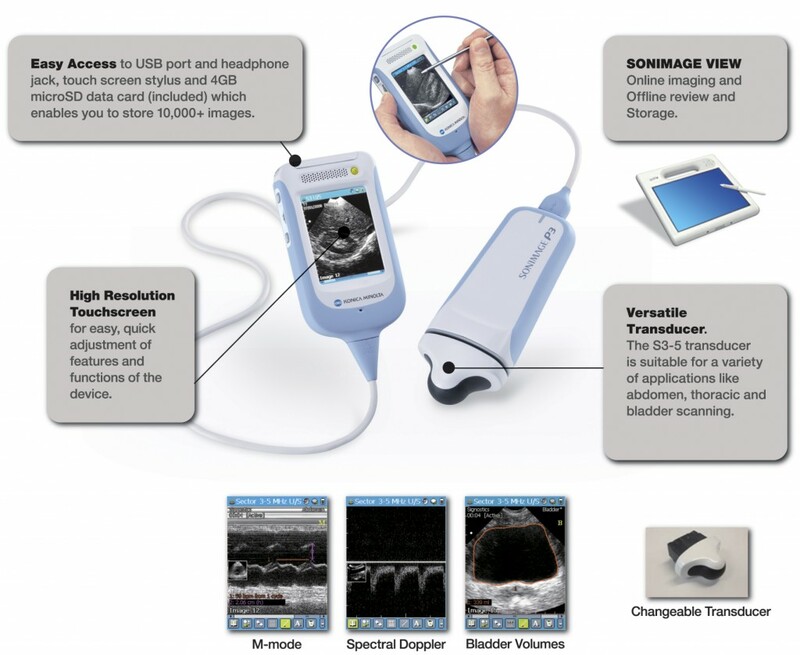 The ultrasound technology is easy to use in various clinical settings. SONIMAGE P3 is small and lightweight, enabling imaging at the point-of-care. It powers up instantly and is ready to use when and wherever you need it. Use as a stand-alone system or simply plug the handheld display unit or ultrasound probe directly into your Windows based PC, laptop or tablet running SONIMAGE VIEW software – standard with the SONIMAGE system. Ideal for occasions when you need a larger display. A revolution improving the quality-of-care at the point-of-care. SONIMAGE™ P3's quick diagnosis during the examination helps reduce unnecessary follow-ups and can improve referral accuracy. Immediate ultrasound helps speed diagnosis, reduce patient wait times, and improve workflow by providing additional information for validation and identification of patients who require further examination. Innovative design makes this real-time system an ideal companion for any point-of-care physician or healthcare professional. The convenience of B-mode, M-mode, Doppler and simple to access presets makes SONIMAGE™ P3 simply indispensable.